The Spinlords: Music in 3D! My compadre Clare and I have a common compassion for music. We know first-hand how it happens to bring the most unbeknownst people to a particular place. You can go to a show as strangers and leave the best of buds. I am proud to say that most of the people I pander as my best friends I met at musical melees. We are witness to music’s wonder and know how it can bridge the greatest of gaps. Music is the world’s olive branch – it can make us gratefully gather despite our differences. It is international language, world-wide words that we all understand. Clare and I also have a sensation to share said music with as many people as possible, so when she said “You should check out The Spinlords,” I said “Sure!” Over the Atlantic Ocean and through the British Isles to Brighton, England we go! The Spinlords are brilliant brothers Jon on guitar and vocals and Dave on vocals and bass, their adolescent acquaintance Alex on guitar, and Claus on drums. Dave and Alex attended the Academy of Temporary Music and The Spinlords saw unsuccessful ensembles and collaborated with many different combinations before concluding their line-up that you can now listen to. Dave also did time with the legendary Yardbirds and brought back his bass experiences to the band. After building a loyal and local fan base the band moved to Brighton to bring their varied vision to fruition and in February 2011 recorded a resourceful, eclectic, experimental 3-song EP. 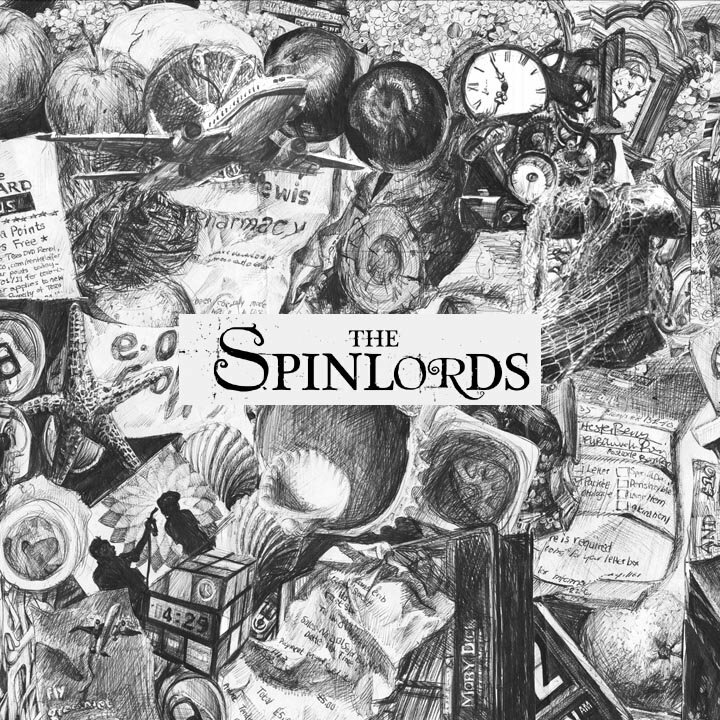 The Spinlords are resiliently refreshing, as no song sounds the same and each song sets a separate tone, from terrific-ly terrifying to magically melodic to casually quirky to potently powerful. The Spinlords have personality protruding from their pores. If you like your bands to not be bland, The Spinlords are making 3D music. They have depth and more than one dimension, and you don’t need special specs to see it! Sara Fincham: What do you think the pros and also the cons are of being so wonderfully eclectic as you are? The Spinlords: One of the main pros is that we can draw on a deep pool of sources and influences. We’ve always tried to avoid limiting ourselves stylistically. Our hope is that we will always be able to write whatever comes naturally. That way we can develop and change organically and not fall in to a rut. Hopefully lots of different people can find something that they dig. The cons are that we are musical vagabonds without a home. We play with the metal folks; Prog guys; Rock’ N’ Rollers and some Indie types but we have no scene to call our home. SF: How have the changes that you’ve so gracefully undergone – whether it be band members, etc, both helped and hurt you? TS: Moving from the wilds of Devon to the decidedly cosmopolitan Brighton certainly aided the shift. With Claus on the drums we felt like we could write the sort of songs that we’d wanted to for some time. This did mean that we had to cast aside out entire set and begin from scratch in a new area. This was painful but necessary as we are confident in this new direction and our new sound. Now it all seems worth it as we have a set of songs that we are proud of and are finally back up to speed. SF: Obviously you all bring very extraordinary elements to the band. What do you each think is the best asset you add to the band, or music? TS: We consider Dave’s voice to be one of the strongest assets we possess. When writing our songs this time around we decided to prioritize the vocals and give space for the melodies. In the old incarnation of the band Dave’s voice was absent for long periods of time during our widdly instrumentalism. Claus is definitely one of the bands biggest hitters. His energy when playing live powers us all and without his professionalism in the studio we would probably kill each other. SF: I have to say that I am so impressed with all the elements you incorporate into your music. Each song really sets a tone, which I think is hard to do when making catchy, memorable music. If someone says “I want you to make scary music for this horror film,” it’s one thing, but to be able to really elicit an emotion with each song is something! Do you think in terms of that – bigger than the band, the words, the beats? TS: To be honest we tend to prioritize the music above the lyrics. We write the music that excites us and then we find the pictures, stories and emotions that come naturally from that. Most of the time, lyrics come as a direct response to the music. SF: Did making the move to Brighton open up other opportunities? Was that something you sat down and decided as a band, or was it not really a band-related decision? TS: It was a practical decision really. We wanted to be near to London but did not fancy being in the capital. Brighton is a cool city with a vibrant music scene and it’s by the sea! Obviously staying in a rural region like Devon makes driving the band forward more difficult. In Brighton we’ve met some like-minded musicians in a band called Concrete Lake and have enjoyed gigging with them. There are definitely more options available to us here. SF: I think your music – it’s not just mindless background noise, but you really ask something of your fans – to have an open mind about music and listen and it’s a give and take. Thank you for giving, and what do you want us to take from it? TS: We want our fans to find something that they can call their own; for them to cherish our music as we do. We are huge music fans and would love people to love us as much as we love those who inspire us. SF: What are your plans for 2012 – new music in the works, I see that you have upcoming shows in the UK. Anything you’d like to promote or prepare us for? TS: We’ve got a series of gigs this month to begin the year with some momentum. We have plans to get in to the studio shortly afterwards to record our new material. We hope to continue building our fan base and keep playing. Our hope is that this year we can step things up a gear and find a bigger audience.